The instrument is mainly used in X-ray fluorescence analyzer sample preparation, can be used in ceramics, powder metallurgy, cement and other sectors of the product sample preparation. The sample pressers manufactured by our company are the matching equipment of X-ray Fluorescence Spectrometry. 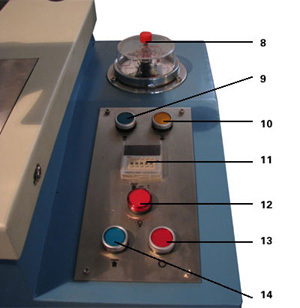 ZYP-400KN and ZYP-600KN Sample Pressers are adopted the methods of internal mould sample-press, with features of easy operation, high efficiency and stable and reliable performance. Adopted internal mould sample-press, pressure head travel is 100 mm. The products can be used for various kinds of sample-pressing methods such as boric acid, steel ring, aluminum cup, plastic ring etc., with characteristics of broad scope of application and stable working. 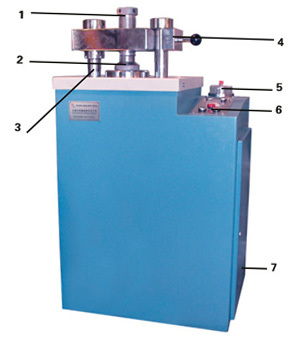 With specific programs of slow pressurization and slow mould-release, the products are favorable to ensure acceptance rate of sample-press, improve sample quality of sample-press. With integrated hydraulic pipe block being specially designed, it not only makes assembling easier, but also reduces the chance of oil leak. With thickening oil-tank cover-board, it makes acting noise of oil pump and solenoid valve smaller. Adopted solid-state block of integrated silicon controlled to replace traditional contactor, it avoids various kinds of troubles caused by frequent starting of motor and efficiently increases service life of this section. The Control section of relay is adopted the welding structure of printed circuit board, it reduces wiring of control box, improves reliability of electric control. Control power source is fully adopted low-voltage of 24V, which makes work safer and more reliable. With compacting structure, small floor space.